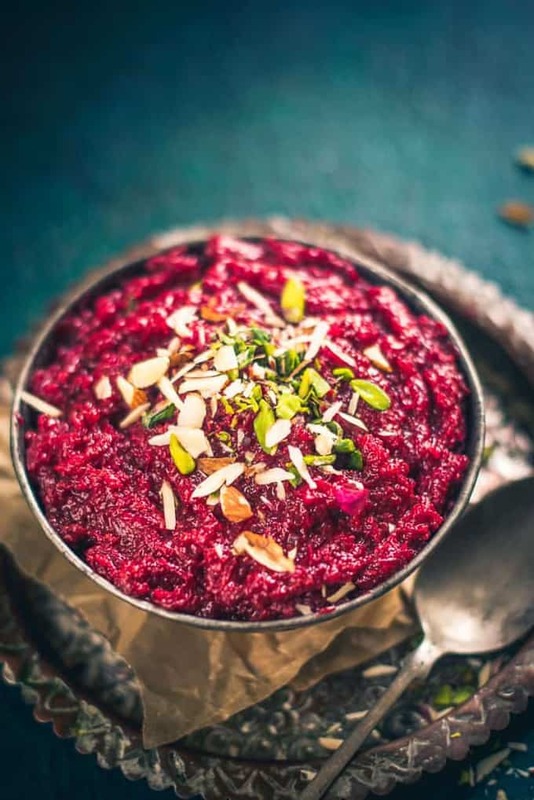 Beetroot Halwa is a unique dessert/sweet filled with the nutrition of Beetroot, khoya, milk and dry fruits. Serve it piping hot and beat all the stress! Here is how to make Beetroot Halwa at home. I have this habit of eating salads along with my lunch and dinner. Even when no other veggies are available, I make sure that at least some fresh Kachumbar Salad gets made and served to my family. However, just to be honest, I will tell you that there is nothing better than eating Beetroot along with your meals. Beetroot helps in boosting our stamina, it even reduces our blood pressure. As my mom tells me always, regular consumption of Beetroot helps in combating cancer as well. Moreover, Beetroot is also full of vitamin C, fiber and quintessential minerals such as manganese and potassium which makes it all the more lucrative for me! Whenever I eat Beetroot, I feel all good and active. So, it is nothing but obvious for me to prepare Beetroot Poriyal, some yummy Beetroot Hummus, Beetroot Pachadi and tangy Beetroot Buttermilk as often as I can because by doing so I and my family stay salubrious round the year! However, this time, I thought of making a dessert/sweet using Beetroot. I had bought some fresh khoya, hence, I thought, what better than making some piping hot Beetroot Halwa? 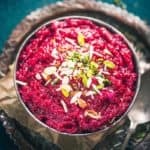 For preparing Beetroot Halwa from scratch, all you need to do is cook grated Beetroot along with milk and after the milk comes to a boil, gets absorbed by Beetroot, it is cooked with ghee, sugar, and khoya. I believe that making an Indian sweet seems incomplete without using dry fruits. Therefore, while Beetroot Halwa was almost ready, I quickly added some cardamom powder, cashew nuts, and almonds. Once the milk comes to a boil, add the grated beetroot and cook until all the milk is absorbed. Add sugar and khoya and cook for another 10-12 minutes on medium heat. Now add cardamom powder, cashew nuts and almonds and mix well. 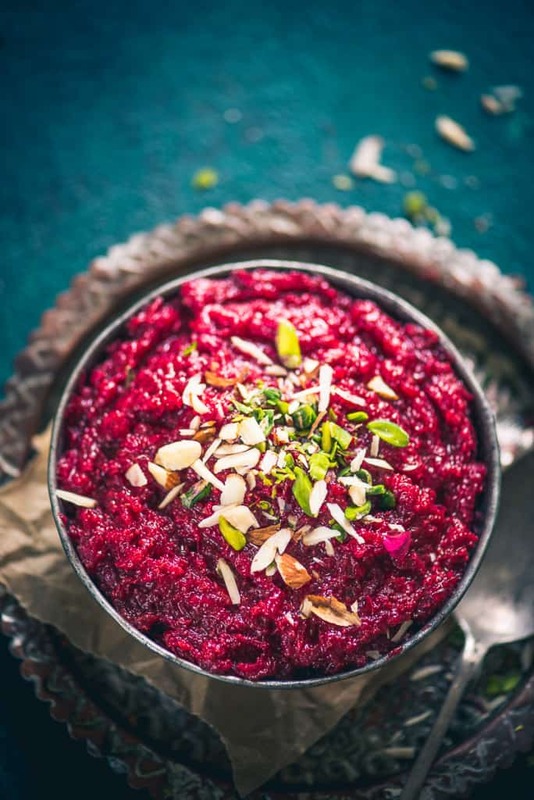 Beetroot Halwa is a unique dessert/sweet filled with the nutrition of Beetroot, khoya, milk and dry fruits. Serve it piping hot and beat all the stress! Add ghee in the pan and cook for 3-4 minutes. Add cardamom powder, cashew nuts and almonds and mix well. Garnish with almond and pistachio slivers and silver foil. Stunning colours and photos. I must give this a try. Thnx Ellanor. Do try it. I am sure you will love it. Look out for Khoya in any Indian store near you. ( used in this recipe)? I will get back to you with my feedback . I have used standard cup measures to measure the ingredients. You can use a google converter to convert in ml. Look forward to your reply. I would like to try this recipe. You can make your own by reducing milk. Honestly you can make the halwa without using khoya but the actual taste comes when khoya is used. You can try adding some evaporated milk.